Thursday- Post my work day! Thursdays I will toot my own horn by showing some of my work. Hope you enjoy! 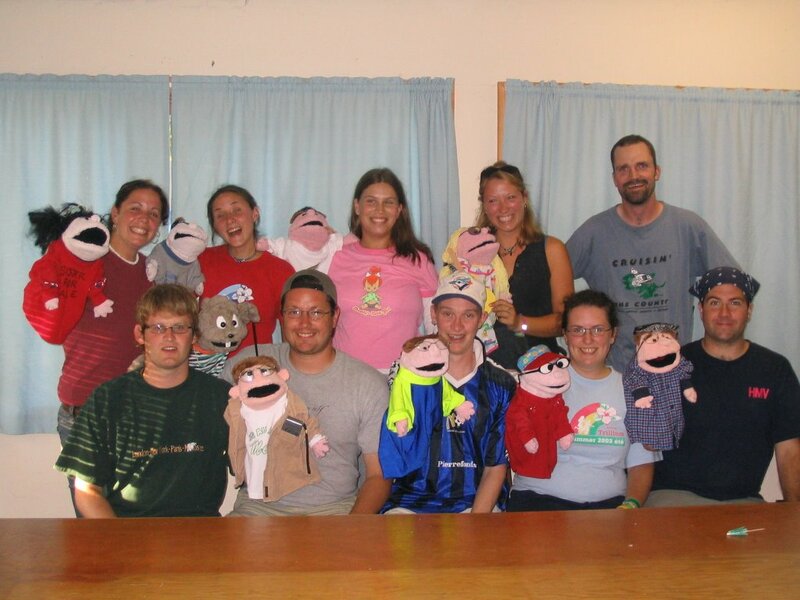 (I’m second in from the left-front row) I built these puppets for our senior staff at Camp Trillium (a cancer camp I work at full-time) These are look alike puppets, emulating their owners. I made all of these by hand in just two days- the nurses assisted in sewing the arms and hands. Materials were hard to come by since our camp is on an island- the puppets were all made from old lost and found towels…clean of course! First of all I know that “Grover” is a licensed character, and I could get into tons of trouble by making him. 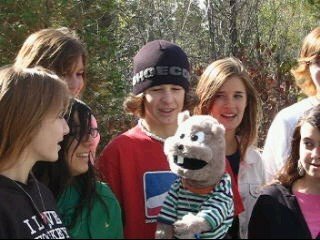 The story behind me building “Grover” is that (while at camp) I was approached by a fellow staff member stating he was doing a “Grover” skit at campfire and needed a costume- the staff member usually painted his entire body blue and acted a near/far skit; the paint was murder to get off and stained his body for days. I literally had an hour to make this costume- I used a foam base as a starting point, then sewed like crazy by hand. The eyes are bleach bottle plastic and the black in “Grover’s” mouth was tripled plastic screening, glued one on top of the other. I made two mistake though: One- As you can notice on the top of the head the fabric was puckered, in my haste, I measured wrong, and made the blue fabric too big; causing it to bunch on top. The second mistake was that I made it to fit the staff perfectly, with no room for movement inside- good for talking through the mouth, but it tended to get extremely hot. Al in all not bad for a hour’s work- I also made gloves to match, but they were hot glued gunned together, then sewn at a later date. This is a photo taken from a promotional video I produced. I’m the one working the puppet 🙂 I also made the puppet – it was the first puppet I used plastic spoons for eyes- A trick I read somewhere. Anyway, had a fun time working on this video. Anyway, I hope this shed some light on my work and I’ll try to post more every Thursday. Thanks and I’ll see ya tomorrow!